In what was the lowest-scoring Super Bowl of all time, and one of the dullest, the New England Patriots defeated the Los Angeles Rams, 13-3 in Super Bowl 53 at Mercedes-Benz Stadium. After a one-year hiatus, 41-year old quarterback Tom Brady, legendary Head Coach Bill Belichick and the Patriots are once again on top of the football world and have made their mark in the NFL history books. While the Patriots are certainly celebrating their most recent victory, for fans, the Super Bowl wasn’t anything to write home about. Midway through the first quarter, Rams linebacker Cory Littleton intercepted a throw from Brady at the 27-yard line, though it ultimately yielded an unsuccessful series. The Patriots followed by again driving downfield into field goal range. After two timeouts in quick succession, the Patriots opted to attempt a 46-yard field goal. Stephen Gostkowski, the third most accurate kicker in NFL history, promptly shanked his attempt. These series of plays constituted some of the only exciting gameplay. Despite good field position, the Rams, led by quarterback Jared Goff and 33-year-old Head Coach Sean McVay, could not seem to find their footing on offense, a trend that continued throughout the game. What seemed like an exciting start to the highly anticipated championship game turned out to be anything but, as the two teams found themselves tied at zero by the end of the first quarter. The first score came with 10:29 left in the second quarter, when Gostkowski redeemed himself and squeaked a 42-yard field goal attempt through the uprights. The Rams again stalled on offense and found themselves down by only three heading into the halftime show. Despite 93 receiving yards from wide receiver Julian Edelman and dominating in time of possession, the Patriots only managed to muster one field goal. It was an uneventful first half of Super Bowl 53, which was projected to be a high-scoring affair. The defensive battle continued well into the third quarter as no team could put together any substantial drives. After a 27-yard reception with 10:06 remaining, Edelman had 120 yards receiving for the game, which was more yards than the entire Rams offense was able to acquire. Arguably the most exhilarating play of the game came from an unlikely source: Rams punter Johnny Hekker. Punting from his own endzone, Hekker punted 65 yards to the Patriots’ 29-yard line — the longest punt in Super Bowl history. After yet another unsuccessful drive by the Patriots, the Rams started to actually look like the team that averaged the second most points per game in the NFL this season. With a series of smooth passes from Goff, the Rams put themselves on the board after a 53-yard field goal from kicker Greg “The Leg” Zuerlein. By the end of the third quarter, the score was tied 3-3 and neither team had found their way to the end zone. Several more uneventful drives later, the Patriots had possession of the ball with seven minutes remaining in the game. A tied score with only minutes remaining in a big game? For Brady, this was familiar territory. After connection with different receivers for several long receptions, the Patriots found themselves within striking distance. Brady lobbed a 29-yard throw to tight end Rob Gronkowski, which Gronkowski caught at the Rams 2-yard line. Finally, after 53 minutes, rookie running back Sony Michel found the end zone, putting the Patriots up 10-3. On the ensuing drive by the Rams, they too marched up the field and looked ready to tie the game when Goff launched a 27-yard pass to wide receiver Brandin Cooks, who was wide open in the end zone. Cooks dropped the pass when Patriots safety Duron Harmon came suddenly to break it up. On the next play, the Patriots’ pass rush pressured Goff quickly, who ended up throwing a bad pass right into the hands of Patriots cornerback Stephon Gilmore with only 4:17 remaining in the game. This effectively ended the game, as the Patriots tacked on 3 more points with 1:12 remaining thanks to Gostkowski’s 41-yard field goal. Goff completed 3 passes to get within field goal range with 8 seconds left, but Zuerlein shanked the ball wide left. After a disappointing offensive showing, Goff, who finished with 229 yards and a 57.9 passer rating, put the blame on himself. Edelman, who finished the game with 10 catches for 141 yards and the Super Bowl MVP trophy, was content with the way the game played out, despite its slow nature. “I’ll take an ugly loss over a pretty win any day,” Edelman said in his post-game press conference. The Patriots now find themselves tied with the Pittsburgh Steelers for the most Super Bowl wins, six, which have all been won with Brady under center and Belichick on the sidelines over the past 18 years. With this victory, Brady set another NFL record as the only player to win six Super Bowls. While many speculate that this could be the end of the Patriots dynasty, everyone should know by now not to bet against them. With Brady saying that Super Bowl 53 would not be his final NFL game, it seems more than likely that the Patriots are going to be back next season defending their title. 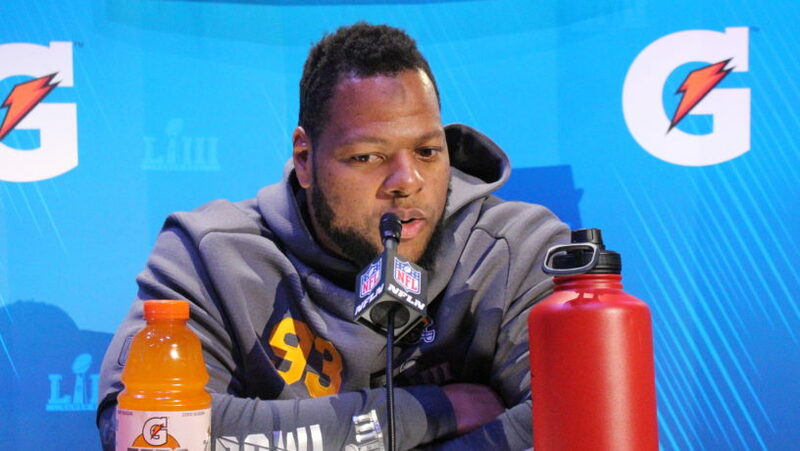 Ndamukong Suh, of the Los Angeles Rams, answers questions at Super Bowl Opening Night. It was six nights before the 2019 Super Bowl, one of the largest sporting events of the year, and the host city of Atlanta was amped up and ready to go. On Jan. 28, the newly renovated and rowdy State Farm Arena served as the venue for Super Bowl Opening Night, a massive annual media event which precedes the main attraction, set to kick off at 6:30 p.m. on Feb. 3 at Mercedes-Benz Stadium. The 53rd Super Bowl will pit the New England Patriots against the Los Angeles Rams, and each team’s biggest fans and stars rallied at the opening event. The Wheel interviewed several players and coaches from both teams at the event. Jesse Weiner, The Emory Wheel: How have you seen the Rams change in the two seasons you’ve been on the team? Robert Woods, Rams Wide Receiver: Seeing the Rams come to Los Angeles, [coming] off a 4-12 [record in 2016], then just going through a full circle with [Head Coach Sean] McVay coming over really turned this whole program around. He brought myself over and [offensive lineman Andrew] Whitworth, then added [wide receiver Brandin] Cooks, [cornerback] Marcus Peters and [cornerback Aqib] Talib. You just see this huge change in transition of football with the coaches and players, and that’s the reason we’re here today. TEW: How has the vibe of the team changed over the course of this season? 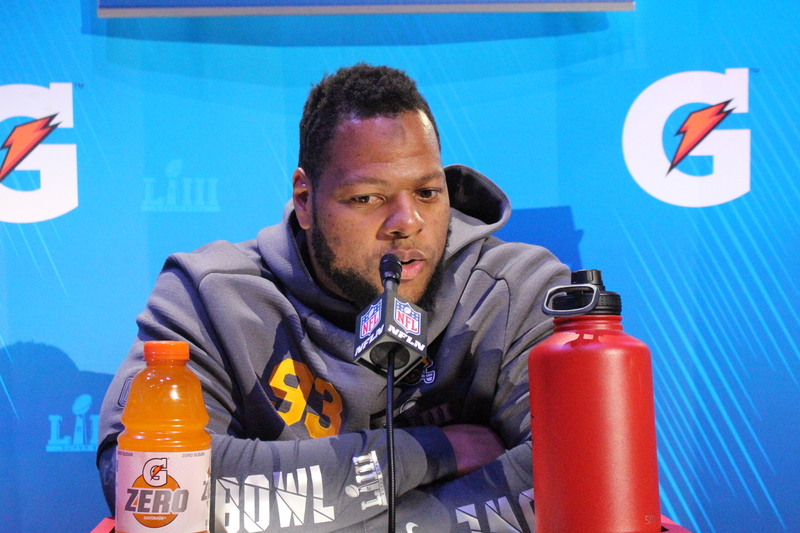 Ndamukong Suh, Rams Defensive Tackle: The vibe of the team has been very consistent: loose and fun. We all enjoy each other [and] we like to spend time with each other outside of the field as well as on the field and in the locker room. We’ve had a lot of fun and enjoyed this ride, and we want to cap it off the right way and always be tied together by Super Bowl 53. TEW: You’re used to dealing with rowdy guys in their 20s. Do you have any advice for Emory professors who also face this problem? Sean McVay, Rams Head Coach: Like anything else, everything starts with building and developing a relationship. My dad said that people don’t care how much you know until they know how much you care. If you demonstrate that you care about people and you can help them in whatever area it is, whether it [be] a doctor or football player, then that’s where you can get that buy-in. Investing in people is what it’s all about. TEW: If you had advice for your college self, what would it be? Brandin Cooks, Rams Wide Receiver: Continue to stay focused. Know where you want to go and don’t let anything distract you from that. Enjoy it, but at the end of the day know there’s something bigger after, so don’t do anything that’s going to cost your future. TEW: If you had to choose a superhero that best reflects you, who would it be and why? Aaron Donald, Rams Defensive Tackle: The Hulk, because he’s big and strong, and I’m strong and big. TEW: What do you miss most about your college days at the University of Arizona? Rob Gronkowski, Patriots Tight End: The house we had. We lived in a house, my brother and two other friends, and it was just always mayhem. It was awesome. TEW: What is it like representing the Jewish community in the Super Bowl and in the NFL in general? Julian Edelman, Patriots Wide Receiver: There’s a lot of representation here, a lot more than people think. It’s an honor; we’re kind of like the underdog people. I appreciate that, and the support that we get from that community is unbelievable and I like being a part of it. TEW: Do you feel like you can be less strict with your players since you’ve been in the Super Bowl a few times before, and they know what they’re doing on this stage? Bill Belichick, Patriots Head Coach: Every year is different; every team is different; every situation is different. What we do this year is different from what we did against other teams at other times. TEW: You were a force for my fantasy football team this season. Do you play fantasy football? James White, Patriots Running Back: I don’t play, but I know a lot of my friends and family play. It keeps the fans engaged, which is pretty cool. While Week Eight did not feature the nail-biting finishes of previous weeks, it did establish the New Orleans Saints and the Los Angeles Rams as the cream of the crop in the NFC. The Saints faced their toughest test so far this season against the Minnesota Vikings. The Vikings came into the game after dominating a respectable New York Jets team and beating the Saints in last year’s playoffs in an all-time classic game, earning the nickname, the Minneapolis Miracle. However, all the confidence possessed by the Vikings while entering U.S. Bank Stadium did not prevent the Saints from soundly beating them 30-20, pushing the Vikings’ record to 6-1 on the season. The Saints previously dominated teams with their explosive offense featuring All-Pro quarterback Drew Brees, Pro Bowl wide receiver Michael Thomas and Pro Bowl running backs Mark Ingram and Alvin Kamara. However, in this game, a staunch Viking defense limited all four of these players. To be fair, the Saints offense did not carry the team. The defense resembled an elite unit, allowing only 20 points, making an interception that they returned for a touchdown and forcing a fumble that they returned from their own 20-yard line to the Vikings’ 32-yard line to set up the Saints offense with a short field. “We’ve got a recipe and we’re sticking to it,” said Kamara in a post-game interview in reference to his team’s overall performance. The Rams also did not play their best on Sunday, but ultimately found a way to beat quarterback Aaron Rodgers and the Green Bay Packers. The Rams trailed by one point late in the fourth quarter but found enough offense to set up a 34-yard field goal by kicker Greg Zuerlein to put the Rams in the lead with two minutes and five seconds left. On the ensuing kickoff, running back Ty Montgomery fumbled while returning the kick-off, sealing the Rams’ victory. With the win, the Rams remain the only undefeated team in the NFL this season. Rams Head Coach Sean McVay heaped praise on his players after the game. Week Nine is expected to bring even more excitement, as the Rams and Saints face off in New Orleans. This heavyweight clash could ultimately decide who receives home-field advantage in the NFC playoffs. From quarterback duels in Atlanta to remarkable upsets in Minneapolis and Detroit, NFL Week Three was a roller coaster ride: thrilling, unpredictable and truly entertaining. It all started with a Thursday night thriller that featured two young, up-and-coming teams: the New York Jets and the Cleveland Browns. The Jets took control of the first half, leading 14-3 at halftime. But in the second half, Browns quarterback Baker Mayfield, the first overall selection in the 2018 NFL Draft, replaced a concussed quarterback Tyrod Taylor and played a nearly perfect game. Mayfield led the Browns to their first win in 635 days, meaning that Bud Light provided Browns fans with free beer. After Thursday night’s exciting game, Sunday did not fail to entertain. Arguably one of the most thrilling games of the year between the New Orleans Saints and the Atlanta Falcons, epic performances from Saints quarterback Drew Brees and Falcons quarterback Matt Ryan were the highlight of Sunday’s game. The two former MVPs’ stats for the game combined to account for 10 total touchdowns, 770 passing yards and zero interceptions. Ultimately, the game came down to a coin flip with the teams tied 37-37 at the end of the fourth quarter, resulting in 10 minutes of overtime. The Saints won the coin toss at the beginning of overtime, meaning that a touchdown by Brees and the Saints offense would win the game. Ultimately, Brees orchestrated a masterful 80-yard touchdown drive capped off by a 1-yard quarterback sneak to win the game. Even Falcons Head Coach Dan Quinn tipped his cap to both offenses. The Kansas City Chiefs built off of their first two wins and further stake their claim as the NFL’s best team this season on Sunday. What the Chiefs’ offense has done this season is truly remarkable. Through three games, the Chiefs have scored 15 offensive touchdowns, tying them with the 1998 49ers and the 2013 Broncos for the most touchdowns through the first three games of the year since the AFL-NFL merger in 1966. They join the 2007 Patriots as the only team since 1970 to score five or more touchdowns in each of their first three games. While the Chiefs cemented their status among the NFL elite, other Super Bowl contenders flopped and lost to less talented teams with poor records. Those expected NFL powerhouses included the Minnesota Vikings, the New England Patriots and the Jacksonville Jaguars who lost to the Buffalo Bills, Detroit Lions and Tennessee Titans, respectively. The most shocking upset was the Vikings’ loss to the Bills, as the Vikings were favored by 16 and a half points and were playing in their home stadium. The Bills blew out the Vikings by 21 points as the host team failed to pass the 50-yard line until the second half against a Bills defense that had allowed 47 points in Week One and 33 points in Week Two. Vikings Head Coach Mike Zimmer offered a blunt assessment of the loss. The NFL rarely ever ceases to produce exciting, dramatic and action-packed games. This week was no different. From explosive offenses to remarkable upsets, fans are left wanting more from arguably the most popular sport in America and eagerly anticipate exciting gameplay in Week Four. From the first kickoff to Carolina Panthers quarterback Cam Newton’s hail mary falling to the turf just out of Panthers wide receiver D.J Moore’s outstretched arms, this NFC South battle had the intensity of a playoff game. The Falcons survived a few late defensive mistakes to pick up a crucial 31-24 win on Sept. 16 over the Panthers at the Mercedes-Benz Stadium in Atlanta. The game started with the defenses of both teams stifling the opposing offenses, allowing three points each at the end of the first quarter. Both teams’ offenses asserted themselves commencing with an 11-yard run from the Panthers to pick up the first down on fourth and four. Panthers MVP Newton slid at the 22-yard line, ending the play. Falcons safety Damontae Kazee delivered a bone-crushing hit to Newton’s head as he slid, sparking a brawl between the Panthers and Falcons. After the game, Newton expressed his relief regarding the close call. While the referees reviewed the play to determine whether Kazee’s hit warranted an ejection, Panthers doctors examined Newton for a concussion and cleared him to play before the referees decided to eject Kazee. Seven plays later, Newton threw a touchdown to wide receiver Jarius Wright to put the Panthers up 10-3. After the drive, the Falcons showed their resiliency, as quarterback Matt “Matty Ice” Ryan responded by leading a 75-yard drive capped off by an 11-yard touchdown pass to the Falcons’ heralded rookie, Calvin Ridley, evening the score 10-10. Defensive end Vic Beasley Jr. and the rest of the Falcons defense responded by handing the ball back to Ryan with the score still tied at 10 and one minute and 52 seconds remaining in the first half. Once again, Ryan showed why he was named NFL MVP two years ago by orchestrating an 85-yard drive that culminated in a beautiful 8-yard pass to tight end Austin Hooper in the back right corner of the end zone, giving the Falcons a 17-10 lead heading into halftime. In the third quarter, Ryan made his only mistake of the day when Panthers rookie Donte Jackson intercepted him at the Carolina 2-yard line. But the mistake proved unimportant, as the Falcons defense forced a quick punt, putting Ryan in position to redeem himself. After the interception, Ryan threw the football in near flawless form, registering only one incompletion. However, these glowing passing statistics were overshadowed, as Ryan stole a page from Newton’s playbook, the best rushing quarterback in the NFL, by rushing for two touchdowns in the second half. The first was a 1-yard quarterback sneak into the end zone, in which Ryan kept his legs churning and found a way through the massive heap of 300-pound offensive and defensive linemen into the end zone. While the first touchdown run required power and strength, the second touchdown run demonstrated Ryan’s power, strength, agility and, more importantly, his will to win. Ryan challenged three Panthers defenders at the goal line by jumping in the air, landing, gathering himself and reaching the ball across the goal line for the touchdown to put the Falcons up 31-17 with seven minutes and 17 seconds remaining. “I can’t remember the last time I had two touchdown runs,” Ryan said, according to the Atlanta Journal-Constitution (AJC). Although the Falcons defense committed some major mistakes at the end of the game, such as allowing Newton to connect with Moore for a 51-yard touchdown to bring the Panthers within seven points, the game was never in doubt. The unit complemented Ryan’s MVP-level of performance to perfection, and the Falcons obtained a much-needed, much-deserved win to move to 1-1 this season. Although it is only week two of the NFL season, this game indicates that the NFC South is shaping up to be the toughest division in the NFL and moreover, any divisional win will be important moving forward. This win could propel the Falcons to a division title and a chance to avenge their last two heart-wrenching postseason losses. The Falcons will play again on Sept. 23 at 1 p.m. against the New Orleans Saints at Mercedes-Benz Stadium. The roads were noticeably quieter on Sunday, and the smell of face paint and burgers tinted the air. We all know what that means. Football is back. The 2018 NFL season started off with a bang this week with several comeback victories and close games. Here is a recap of some of this season’s most intense victories and letdowns so far. Heading off the weekend, the defending champions Philadelphia Eagles faced off against the Atlanta Falcons on Sept. 6. The Eagles squeaked by with an 18-12 victory. Both offenses struggled, but the Eagles prevailed through a magical trick play, two goal-line stands and inefficient red zone offense from the Falcons. Of the slate of games on Sept. 9, the highlight came toward the end of the night when quarterback Aaron Rodgers led the Green Bay Packers to a come-from-behind 24-23 victory over the Chicago Bears. Despite suffering an injury in the second quarter, Rodgers returned to the game in the second half and finished with 301 total yards and three touchdowns. Bears defensive star Khalil Mack made an impressive debut, wreaking havoc all over the Packers’ offensive line, finishing with one strip sack and one interception in limited playing time. The Cleveland Browns ended their 17-game losing streak with their opening-day game against the Pittsburgh Steelers — albeit with a 21-21 tie. Both teams missed game-winning field goals in overtime. The Steelers struggled throughout the game without their star running back Le’veon Bell, who is still holding out for a new contract. In a surprising game, the Tampa Bay Buccaneers dropped 48 points over the New Orleans Saints’ 40. The Saints’ horrendous defense suffered under Buccaneers quarterback Ryan Fitzpatrick’s total of five touchdowns. The Saints showed several signs of weaknesses on defense against what many considered the worst team in the league. Among the shootouts on Sunday, the Kansas City Chiefs impressed with their 38-28 victory over the Los Angeles Chargers. New Chiefs quarterback Patrick Mahomes and offensive star Tyreek Hill dominated the Chargers’ defense. Mahomes threw for 256 yards and four touchdowns showing off his cannon of an arm, while Hill had 169 receiving yards and two receiving touchdowns alongside a 91-yard punt return touchdown. Sept. 10 was a day of smooth victories for the New York Jets and the Los Angeles Rams. The Jets blew out the Detroit Lions 48-17. Jets quarterback Sam Darnold impressed after throwing an interception return for a touchdown on his first throw. The Jets defense caught five interceptions, humbling Lions quarterback Matthew Stafford, who had an unmemorable game in which he threw just one touchdown and four interceptions. Despite head coach Jon Gruden’s long-awaited return to the NFL, the Oakland Raiders lost 33-13 to the Rams. The Rams looked in every way a Super Bowl contender with an impressive defense that had several sacks and an interception returned for a touchdown to finish off the Raiders. Week One brings out overreactions from fans and pundits alike. No, the Buccaneers are not going to be Super Bowl contenders. Yes, the Steelers and Saints are going to be fine even with disappointing starts. However, there are some things from Week One that will likely hold. The Buffalo Bills looked abysmal — who knows why quarterback Nathan Peterman started the game after his debut last year throwing five interceptions? The Bills also have no weapons on offense and are probably going to be the doormat of the AFC East. Mahomes looks like the real deal for the Kansas City Chiefs, and head coach Andy Reid once again has positioned the Chiefs in prime playoff contention. In the NFC, the Falcons underwent many of the same issues that plagued the team last year. Offensive coordinator Steve Sarkisian has yet to fix the red zone problems. This could spell the Falcons’ demise if they make it to the playoffs again. The Bears’ blown lead might either set up a rallying cry to become a playoff contender, or they might not be able to recover. Meanwhile, the Rams and the Minnesota Vikings look like the prime Super Bowl favorites with very impressive opening weekends. Week Two of the season starts on Sept. 13 with an AFC North rivalry matchup between the Baltimore Ravens and the Cincinnati Bengals. The 2018 NFL Draft is almost upon us. You can feel it in the air. The draft “experts” are creating mock drafts. NFL teams are scouting every prospect. Fans are clamoring for their teams to draft their favorite players. And, the Cleveland Browns are drafting first overall — again. The 2018 NFL Draft may be remembered as one of the most entertaining and unexpected drafts in recent memory. Nevertheless, here are three headlines that may or may not become a reality in this year’s draft. With the highest potential among the quarterback prospects, Sam Darnold is the perfect pick for the Browns. He possesses the arm, the mobility and the leadership that every NFL team covets. Although he didn’t throw at the NFL Scouting Combine, he was lights-out in his pro day at the University of Southern California. Darnold possesses traits that other potential top QB prospects lack. For example, he exhibited strong character when he swapped flights to throw for his teammate. In addition, his experience exceeds that of other players, like University of Wyoming QB Josh Allen, as he faced tough competition in the Pac-12 Conference, while Allen played in the less competitive Mountain West Conference. His focus sets him apart from other prospects, such as University of California, Los Angeles QB Josh Rosen, who put a hot tub in his freshman dorm, just because. Also, University of Oklahoma QB Baker Mayfield has well-documented maturity issues such as resisting arrest and a crotch-grabbing incident. The fourth overall pick is an easy choice. If former Pennsylvania State University running back Saquon Barkley is on the board, Cleveland should take him — no questions asked. With the Denver Broncos and New York Jets seemingly locked in on QBs, the Browns will be more than happy to have the best prospect in the draft fall into their laps. Barkley, rocking an NFL-ready 6 feet and 233 pounds, impressed at the NFL Scouting Combine. Barkley blazed the 40-yard dash in a lightning 4.40 seconds, adding to his 29 reps in the bench press and 41-inch vertical leap. With Darnold as QB and Barkley as RB, the Browns’ offense would be set for the foreseeable future. Here’s to hoping they don’t pick first again next year. The New England Patriots are loaded this draft. After wide receiver Brandin Cooks’ trade to the Los Angeles Rams, the Patriots hold two first-round picks (No. 23 from the Los Angeles Rams and No. 31) and two second-round picks (No. 43 from the San Francisco 49ers and No. 63). In classic Bill Belichick fashion,the Patriots’ draft plans are secret. According to NFL insider Adam Shefter, the Patriots may trade up into the Top 10 in hopes of drafting one of the premier QB prospects. Tom Brady will be 41-years-old this upcoming NFL season, so the Patriots will soon need to find his successor. Others have speculated that Belichick may attempt to trade both first-round picks to the New York Giants to obtain superstar wide receiver Odell Beckham Jr. However, both seem like longshots. Beckham Jr. doesn’t fit the mold of “The Patriot Way,” and, with a massive contract on the horizon, the fickle Patriots hesitate to pay around $20 million per season. 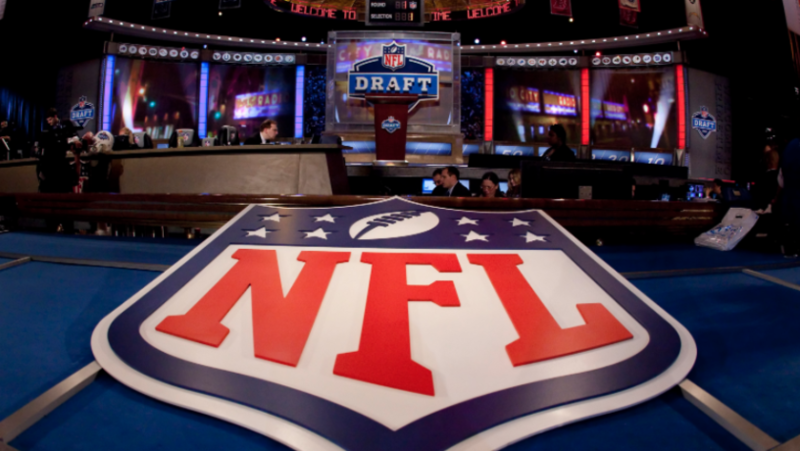 Although they do need a QB this draft, the Patriots should look into a Day-2 QB such as the University of Richmond (Va.)’s Kyle Lauletta or Oklahoma State University’s Mason Rudolph, if still available. After lofty expectations to begin the 2017 NFL season, the New York Giants were — to put it lightly — awful. With former General Manager Jerry Reese and former Head Coach Ben McAdoo fired, the Giants hope to revamp the franchise by finding young talent in the draft. Holding the second overall pick, the Giants have a plethora of options. But the Giants should trade their pick and move back. While the Buffalo Bills are a viable trading partner with the No. 12 and No. 22 overall picks, the Giants should do business with the Denver Broncos if the opportunity arises. That trade would allow the Giants to obtain Denver’s No. 5-overall pick, along with potentially a pair of second rounders. If the 49ers can obtain a first, two-thirds and a fourth from the Chicago Bears to move down only one pick, the Giants should gain some considerable assets. And with that fifth selection, the Giants can shore up their offensive line by drafting University of Notre Dame (Ind.) guard Quenton Nelson. It’s more than likely, however, that New York will trade Beckham Jr. by draft night. I would be shocked if the Giants acquire two first-round picks, but they should be able to stockpile a considerable return for Beckham Jr.’s services. With Beckham Jr.’s on-and-off-the-field antics becoming a nuisance to the team, it’s time for the Giants to cash in and trade him away. With an arsenal of picks following these trades, the Giants should be in a great position to draft their next superstar.